probably reflect on other aspects of the trip in later posts. 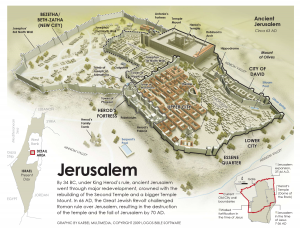 But here I want to focus on the privilege of being in Jerusalem and visiting some of the sites which were (or were near to) places which figured in the trial, death and resurrection of Jesus. Walking those streets, looking out over the city, thinking about some of the events was a powerful and moving experience and reminded me of the eternally significant encounter and confrontation which was taking place. 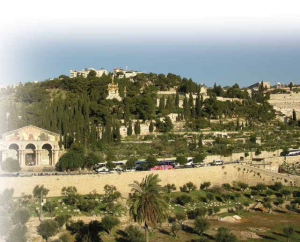 From the top of the Mount of Olives we looked over the valley and onto the hill of Jerusalem – a sight which would have confronted Jesus as he made that journey. 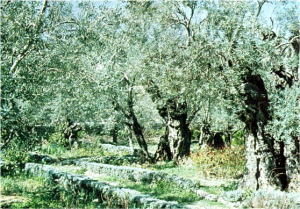 We went down into the Garden of Gethsemane and saw the olive trees – some of which may have been there when Jesus contemplated what was ahead of him, when He cried out to his father, where he was betrayed by a close friend and when He was arrested and led away. Here we see the start of the confrontation – between those who were seeking to ensure ritual and legal purity, those who were seeking to maintain the status quo with the occupying Roman forces against a man who was making claims about who He was and the importance of following Him. 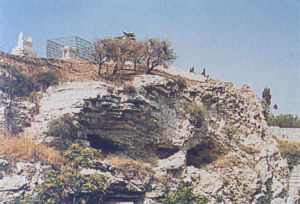 As we went into St Peter in Gallicantu – built to commemorate the house of the high priest where Jesus endured his first trial – we thought about how he was denied by one of his closest followers, was subject to an illegal trial and interrogated as to who he really was. 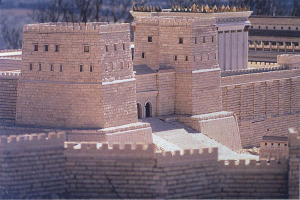 Before the high priest, the religious leader of his people, he confidently stated that he was, indeed, the Messiah – the one whom God has promised to send to redeem his people. He made it clear that he would, one day, by seen seated in power and authority at God’s right hand (Matthew 26:63-54). This was too much for the priest, as he saw all that he stood for being challenged and under threat and so sent him on to the Roman governor for further examination. 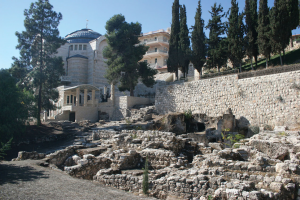 We saw the place where Jesus was thought to have been examined by the Roman governor, the local representative of the most powerful empire in the world who found him not guilty but – under pressure – still caused him to be beaten and condemned him to death. And, soberly and thoughtfully, we visited the Chapel of the Flagellation where, traditionally, that beating took place. 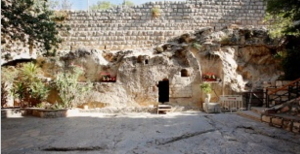 We walked the streets which (or near which) Jesus would have walked and visited the most likely sites of his crucifixion, burial and resurrection and reflected on those word-changing events and their significance. There was a sense of pilgrimage, a sense of history, a sense of something amazingly significant happening as we reminded ourselves of how one man, in humility and gentleness and love, stood against the forces which were massed against him, endured all they could heap on him and emerged victorious. On one hand we see the inhumanity of man, the desperate desire to hang on to power, the willingness to forgo justice in order to achieve their goals and the surprising alliance between opposing forces united – for a moment – against a common perceived threat. And how often we see the same happening today. On the other hand we see someone who, even when in chains and beaten, was in total control of the situation, behaved with quiet confidence, knew what he was going to do and accomplished his purpose for the benefit of all creation. A clash of kingdoms but where the one who seemed outnumbered, outgunned and defeated was victorious and triumphant. And for those who have chosen to follow him he calls us to continue to stand against the forces and power of evil wherever we find it and work to bring his kingdom to earth.